With the minutes now ticking away until midnight I think it's high time for a review of today's happenings. We all realise by now that today was the final day of the January transfer window and at times it seemed the world had gone mad. At times it was akin to watching the trading on the worlds stockmarkets with buying, selling, loaning and just plain old getting rid of unwanted stock. In our corner of the bull market quite a few tears have been shed following the long dreaded loss of Iyseden Christie and Mark Jackson to League 2 side Rochdale. A combined fee of �35,000 was handed over by the dour Northerners and willingly grasped by the grubby hands of Harriers chairman Barry Norgrove and financial whizz kid John Baldwin. From the comments made by Mark Yates following the shady deal he wasn't too happy with our leading scorer Christie being sold behind his back but he had accepted that Jackson wanted a return to whippet land. In exchange for these two hard nosed, time served pro's we get an old loanee back on loan, Andy White, and another rookie from Watford on a season long loan - what is this new connection between the two clubs all about? Andy White is well known around these parts as being a likeable guy but not one with a stack of goals in him. He wasn't thought of too highly at Notts County, from whence he came, and they're all hoping that we'll keep him for a bit longer than the initial month. The lad from the very edge of civilisation according to Londoners like Windsor Harrier is an 18 year old called Junior Osborne. Just emerging from their youth side he's supposed to have a bit of pace and plays in midfield but has been seen zipping up and down the flanks. At the same time as the arrivals coming we also had another one out through the exit door. 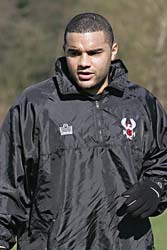 Simon Heslop, here on loan from Barnsley since October, had never really found favour under the new regime and was sent back after making 27 appearances for us and scoring just two goals. With just two hours to go before midnight struck and the glass slipper being dropped on the stairs we completed what was probably the strangest signing of the day when we bought in a self confessed crock. 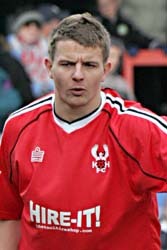 Paul Smith, once of Sheffield Wednesday and Hartlepool but residing for the last two weeks in the sleepily quaint one horse town of Alfreton, arrived here. After admitting to the fans that he has a gammy knee and can only play at Conference level if the winds in the right direction he will see himself slotting into the position vacated by Mark Jackson. Mike Marsh had a gammy knee though and he turned out to be quite useful. Then again he had a bit of pedigree to see him through. So we now have a new team to watch for the remainder of the season and by the time we manage to put names to all the faces they'll all be off to pastures new and the chance of the Golden Ticket elsewhere.